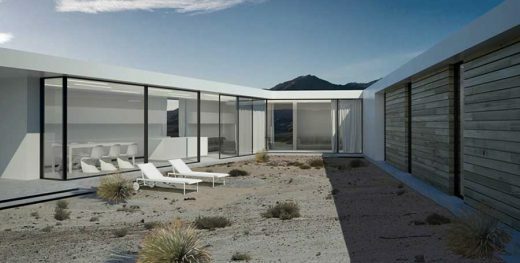 The project is located on 15 acres of land several miles outside of Palm Springs, CA in the Mojave Desert. The architects’ approach was to minimize environmental and ecological impacts while still meeting the objectives of the client’s brief. 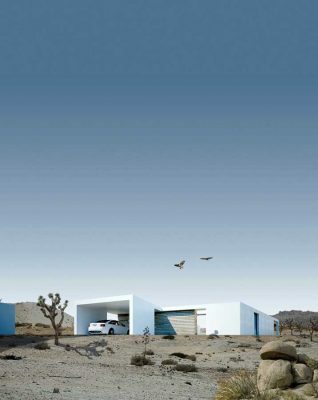 In doing so, Platform For Architecture + Research (PAR) aimed to contain land disturbance by siting the villas within their natural topography as much as possible. The architects also developed more compact building footprints by increasing outdoor living spaces that take advantage of the temperate, sunny climate. 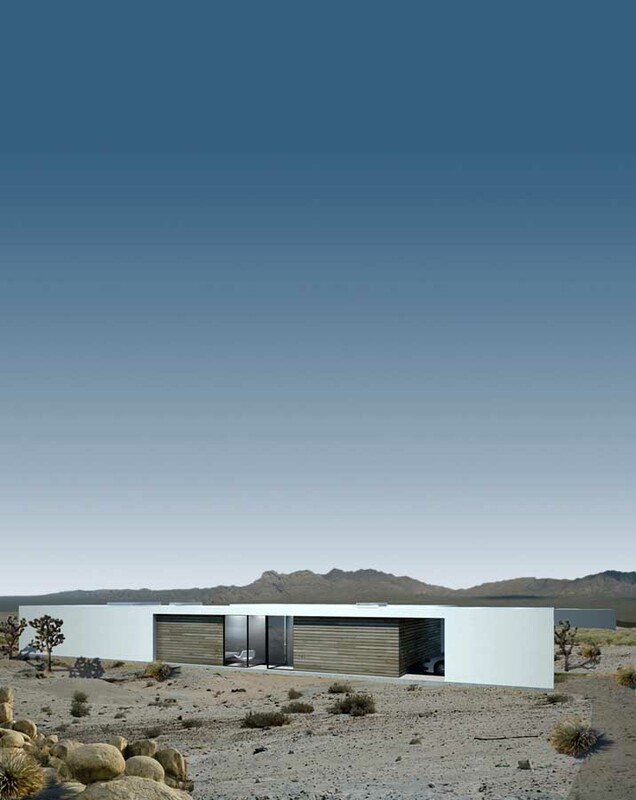 The sweeping desert site has been subdivided into 18 unique plots accessed by discreet, naturally paved roadways. Plots are on average one acre and have a low lot coverage of 13 percent. Villas have been sited to maximize views and privacy while also making use of prevailing northwesterly winds for natural ventilation. A seamless flow between indoors and out is evident where private lanes lead to courtyard entrances. Three villa typologies—Villa Y, Villa E, and Villa L—are organized around a series of courtyards sympathetic to the surrounding nature. The designs aim for the closest possible relationship between the interior space and the predominant presence of the desert landscape. The contrasting forms of each villa are unified through similar architectural massing and shared materials and details. Each property features a formal living room, dining room, family room, two guest suites, a master suite, and staff area. Residents will have no shortage of leisure options with over 2,000 square feet of outdoor living area including private pool, fireplace, dining, and lounging areas. Sustainable development strategies such as solar roofs, thermal massing, cross ventilation, shaded glazing and xeriscaping have been incorporated at master plan and building scales. At the master plan scale, roadways and driveways have been designed for natural drainage and visual integration through the use of stabilized, decomposed granite paving. Design Intent: To integrate new construction with the landscape by utilizing the architectural capacities of existing subtle landforms.